All her life, Emily felt different from other kids. Between therapist visits, sudden uncontrollable bursts of anger, and unexplained episodes of dizziness, things never felt right. For years, her only escape was through the stories she crafted. It wasn’t until a near-fatal accident when she was twelve years old that Emily and her family discovered the truth: a grapefruit-size brain tumor at the base of her skull. 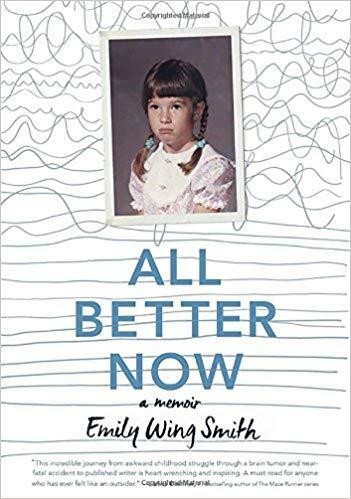 In her memoir, “All Better Now,” Utah writer Emily Wing Smith chronicles her struggles with both mental and physical disabilities, the devastating accident that may have saved her life, and her way through it all: writing. Emily Wing Smith received her master’s degree in writing for children and young adults from Vermont College is the author of “Back When You Were Easier to Love” and “The Way He Lived.” She lives with her husband in Salt Lake City, where she writes, bakes chocolate chip cookies, and occasionally substitutes at her old high school (which hasn't gotten any less odd). Emily Wing Smith on Access Utah.